Now you have achieved the PADI Open Water Scuba Instructor (OWSI) certification by completing your Instructor Development Course (IDC) and Instructor Examination (IE) you will be needing some experience in teaching. You may have completed some PADI Specialty Instructor courses, after your IE with a Course Director, which has made you a PADI Speciality Instructor. Now to put all that theory into practice with real students! Once you have gained 5 PADI Specialties and taught a number of PADI courses you can apply for the PADI Master Scuba Diver Trainer. We can offer you the opportunity to work alongside us teaching all the PADI core courses from PADI Open Water through to PADI Divemaster, as well as the Specialities you have gained. 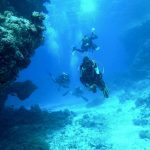 There is no better way to learn than through teaching real diving students in real situations, with our experienced PADI Staff Instructor on hand to assist should you need it. If you haven’t got the 5 PADI Specialties you need for MSDT certification we can help there too. All this can be done during the MSDT Internship here in Tenerife. The next stage in your PADI Diving career is the PADI Staff Instructor certification.